Summary Second generation Broadcom SoC based AC1200 router with Gigabit ports, USB 2.0 & 3.0 drive and printer sharing and PPTP VPN server. Let's get right to it. 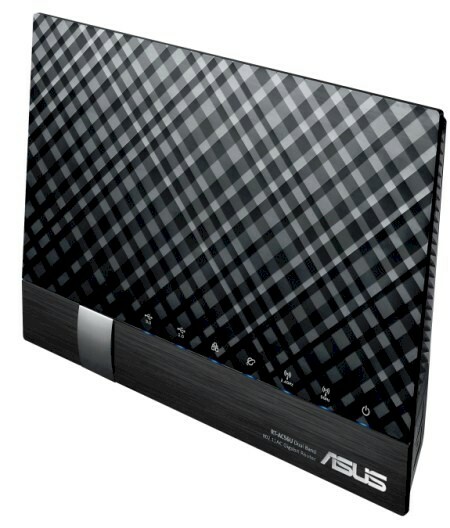 This is a top-performing AC1200 router. It's also priced at twice what you'll pay for some not-so-good AC1200 performers. But it's also only $10 less than its RT-AC66U AC1750 sibling. Worth it? Let's see. While many routers come in a flat rectangular form factor, the RT-AC56U breaks the mold with a design that sits vertically and cants backward at what appears to be about a 15 degree angle. A metallic foot keeps it from falling over backwards. The antennas are located near the top of the device. Perhaps raising them above the desktop helps the performance. The front of the RT-AC56U has LED status indicators as shown in the callout below. There are individual indicators for each of the USB ports and each of the 2 wireless bands. There are also LAN, WAN and as well as a power indicator that doubles as a status indicator. A couple of things are worth mentioning about the RT-AC56U rear panel. There is a Wi-Fi On/Off button that lets you disable Wi-Fi without having to log into the Admin interface. Each of the Ethernet ports has two link/activity indicators. One shows link/activity for a 1000 Mbps connection; the other shows 10/100 link/activity. This feature isn't called out in the instruction manual. USB ports - there's a USB 2.0 port and a USB 3.0 port. You can connect USB drives/flash drives into these ports, or use either of them to charge an iPad. In addition, the RT-AC56U has a built in print server. Finally, the USB ports can be used for sharing a 3G/4G wireless modem. Here's a link to supported 3G/4G modems. Tim published an article that detailed the "Inside Story" for the ASUS RT-AC56U as well as the RT-AC66U. I'll insert a couple of photos from his story for those that don't want to refer back to it. The FCC ID photo of the rear of the board shows ASUS' signature large heatsink that provides thermal relief for all the main components. You can also see the four antennas—two per band—printed onto the board. Here is the rear side again, but with the heatsink and three RF shields removed. The processor SoC is at the upper left, 2.4 GHz radio below it and 5 GHz radio to the right. Below is a summary of key components. In comparing the RT-AC56U to other AC1200 class routers, it's interesting to note that the ASUS router is the only one with 256MB of RAM. We'll see if the upgraded processor, more memory and a USB 3.0 port makes a difference in the storage performance section.